Sources: Wild harvested from lakes and beaver ponds in Wisconsin. Most available from April through October. 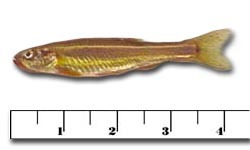 The Finescale is a very colorful baitfish that is gaining popularity. Gollon Brothers is currently culturing this species on an experimental basis, with early results looking very promising for future large-scale farming.